Taiping Hou Kui tea is grown at the foot of Huangshan (黄山) in Taiping County, Anhui. The tea has been produced since the beginning of the 20th century and is produced around the small village of Hou Keng (猴坑). It won the "King of Tea" award in China Tea Exhibition 2004 and is China Famous Tea. Tai Ping Hou Kui is grown in the western reaches of Huang Shan’s mountain range in three villages in the Tai Ping prefecture: Hou Keng, Hou Gan, Yan Jia. These villages surround a large lake that is kept full with a dam and sits at an altitude of 700M above sea level. Here there is big difference in temperature between day and night, a condition that is said to make a special flavor in tea. Humidity and fog from the lake create ideal moisture and shade for tea plants, and the area’s soil is dark and mineral rich. Its fine grains are loose, well drained, and permeable, but still retain moisture. Seventy-three percent of the gardens are grown on the back slope of the mountain, that is they are grown on the opposite side of the sun’s east-west path. The mountain is very steep and must be climbed to harvest and care for the tea, a demanding climb and descent. These bushes are mostly shaded from direct sunlight. Tea grown under the shade will have increased nutrition and sweetness. It is renowned for its "two knives and one pole": two straight leaves clasping the enormous bud with white hairs. The oven-made leaves are deep green in color with red veins underneath. The tea shoots can be as long as 15 centimetres. They are plucked from the Shi Da Cha, a large leaf-variety found only in Anhui Province.The tea has an orchid fragrance. The first infusion is said to be aromatic, second full bodied, 3rd and 4th pleasantly scented. It is famous for the Monkey Rhyme (Hou Yun), a sweet aftertaste that can be found only in the best of Tai Ping Hou Kui tea. Picking：Harvesting takes place once a year in Spring - for just 2 weeks.Picking starts when 20% of the tea shoots acquires one bud with 3 slightly unfurled leaves. Traditionally, this takes place around 20 April to 5 May. But climate changes have shifted the season forward.After picking, the tea shoots are made by hand in the same day. Lianjian breaks off the top end of the tea shoots for further processing. A high grade can be 15 centimetres long, which is then baked to about 5 centimetres. Shaqing applies low heat to a large wok to kill the enzymes and halt the fermentation process. The process lasts 2 to 3 minutes. The wok has a relatively constant temperature at around 110 degree Celsius. Maohong, erhong and tuolaohong oven and press the leaves so that they are straight, flat and clasping the buds. Temperature reduces from 100 to 60 degree Celsius. 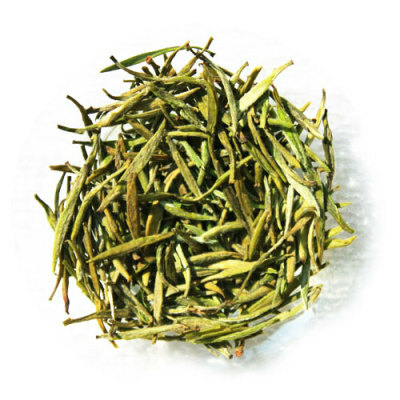 Huangshan Mao Feng tea (黄山毛峰) is a green tea produced in the Anhui province of China. The Tea is one of the most famous teas in China and can almost always be found on the China Famous Tealist. The tea is grown near Huangshan (Yellow) Mountain, which is home to many famous varieties of Green Tea. Huangshan Mao Feng Tea's English translation is "Yellow Mountain Fur Peak" due to the small white hairs which cover the leaves and the shape of the processed leaves which resemble the peak of a mountain. The best teas are picked in the early Spring before China's Qingming Festival. When picking the tea, only the new tea buds and the leaf next to the bud are picked. It is said by local tea farmers that the leaves resemble orchid buds. Huangshan Maofeng is one of the top ten greatest teas of China. Its reputation and status can be traced back to the Qing Dynasty. A type of fried green tea, Maofeng is a living testimony to the old adage ‘famous mountains produce excellent teas’. 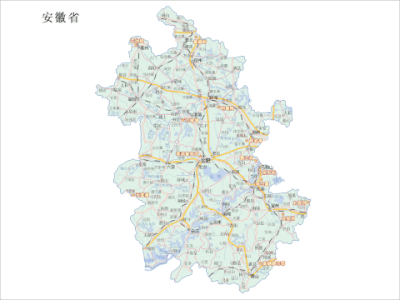 Its place of origin is the She County in Anhui Province. Maofeng is harvested between Qingming and Guyu (a period that covers early to mid April). Tea growers pick the most vibrant-looking buds before hand-frying them. The tea leaves are slightly curled, green in color with a tinge of yellow hue. When brewed, the liquor yields a light green color with yellow undertones. Such colors show the freshness of the tea. Maofeng tastes extremely smooth and aromatic with a lingering aftertaste. Maofeng tea leaves have a thin layer of frosty coat on their surface, resembling tiny hairs. This is where the name Maofeng, which literally means ‘hairy peak’ in Chinese comes from. Maofeng is classified into four different grades, ranging from premium to third grade. Premium Maofeng has the following characteristics: tender buds, leaves shaped like the tongue of a sparrow with a frosty coating and golden sheen, mellow but lingering aroma and clear liquor when brewed. What sets Liu An Gua Pian apart is undoubtedly its shape. The tea leaves are significantly larger than most other green teas. They are shaped like a plump watermelon seed, a popular nut in China. But to Westerners, almond probably describes the shape better. The tea leaves are large and flat with a slightly curled edge. There are no stems in the leaves. Liu An Gua Pian boasts a bright emerald color, which is why it is also known as ‘ Liu An Emerald Pedal’. There is a very thin layer of white frost on the leaves but not obvious. Since Liu An Gua Pian is thoroughly fried after harvest, the raw leaves have a toasted smell. If they smell fresh instead, it is a sign that the frying was not done properly. But once brewed, the tea tastes sweet, crisp and refreshing, making it a great summer tea. Liu An Gua Pian is also a great antidote to indigestion and fatigue. Liu’an Guapian, also called “Melon Seed”, gets its name from the shape of the processed tea leaves. 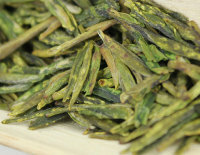 It is a special type of green tea and the only green tea in China that uses no stalks or buds in its production. After picking the bud and two leaves from the plant, the tea maker cuts the bud and any stem from the leaves, creating equal-sized single leaf pieces. These carefully cut leaves are then pan-fired over low heat, shaping the leaves into a melon seed shape and creating a tea with bright green colored leaves. Brewed color: Yellow with green tint. Flavor: Refreshing, green, vegetal, sweet almost, with a suggestion of seaweed. Aftertaste: Subtle, lingering, but decided. Preparation: For best results, use spring or mineral water. Bring it to a boil, then, after taking water off the heat, wait about 10 or 15 seconds before onto the side of the pot or gaiwan (avoid pouring on the leaves directly). one of the top ten teas of China. 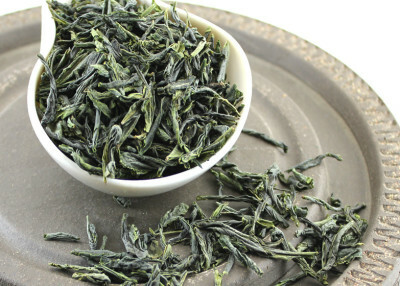 Named after the tea leaves’ resemblance to a huge melon seed, Liu An Gua Pian is a unique type of green tea produced in Liu An County in Anhui Province. . In China, Wuliqing was known since the Song dynasty under various names. It was said to be a very exquisite and refined tea. Wuliqing was made in the south of Anhui province with tea leaves from wild tea bushes. But its production had been discontinued. scientific result proves that Wu Li Qing is not only high in minerals and vitamins, but also contains high amount of selenium which may aid in preventing cancer. The taste and fragrance is delicate and floral in nature, with a hint of magnolia flower note. Very refreshing. Long and narrow tea buds, each measuring between 1.2 to 1.5cm in length. When steeped, the tea buds stand upright in the cup, occassionally floating down and up as if they are dancing. In Qing Period, WuLiQing Tea have exported to Europe.it is said that WuliQing Tea was considered treasures tea and popular in the Nobles society. Jingting Lv Xue (Jingting Green Snow Tea),originating in Jingting Mountain, north to the Xuancheng city, Anhui province. the tea made in Xuancheng city is famous for "Jing ting lv xue", "GaoFeng Yun Wu","Shuidong Heng Wen", and Jingting Lv Xue is the most well-known one. It has a long standing reputation , the "Xuancheng County" recorded, "In Ming and Qing Dynasty, tribute of Jingting Lv Xue for each year are more than 150 kilograms" . However, Xuanting Lv Xue was lost in the late of Qing Dynasty, in 1972,tea factory of Jingting moutain, Anhui province started to recover, and in 1978,developed compeletly, Jingting Lv Xue has received a lot of honor, together with Huangshan Mao Feng, Liuan Gua Pian honored the three major premium quality tea of Anhui province. It has special reduced fat fat cancellation, reason is known as tea in the "king of the reducing weight". It to help digestion, eliminate fatigue, excited nerve, strong heart, and stomach, convergence, diuresis, detoxification and so on all significant role. Tea area is mild climate, abundant rainfall, fertile soil, organic matter and more ecological conditions are favorable. Laozhu Dafang tea begins to pick before Ching Ming Festival forty-five days per year, picking standard is a bud and a leaf, its length is about 1.5 cm-2.5cm. Laozhu Dafang tea in the production process, there are fixing, rolling, baking and other processes. Ding Gu Da Fang tea, different from the general tea, similar to a longjing, long flat piece,, and oil moisten, contain cooked the scent of corn. Its tastes, flavor aroma fierce, like liquor, tang green. received a lot of honor, together with Huangshan Mao Feng, Liuan Gua Pian honored the three major premium quality tea of Anhui province. Laozhu Dafang tea is stir fixation green tea, the history tea of Anhui. Xiu Ning Song Luo is historied famous tea.Xiuning Song Luo tea was founded in Longqing years in Ming Dynasty.In Ming and Qing Dynasty,Song Luo Mountain is Buddism Holy Land.The way of making Song Luo Tea is firstly created by Dafang Monk. Xiu Ning County is the hometown of organic tea in China, holding abundant products resource. . As “the first exporting county of green tea in China”,The county has been ranked as “state organic tea standardization demonstration plot”, “demonstration base of nuisance free tea producing county” successively. The area of the organic tea gardens with the issued certificates, the exporting amount of Green Tea and Mei Tea all take the first place among the counties in China. YueXi CuiLan green tea is produced in YueXi County in Anhui Province, where is the abdomen of DaBie Mountains.It is named as Cui Lan because it is alike the shape of orchid flower. YueXi CuiLan green tea is firstly produced in the 80s of last centry. In 1985, it won the new-created “10 famous tea” by China Ministry of Agriculture. It is presented to foreign presidents as “China gift tea” by China Ambassadors in 2010. Its original tea area--- Yuexi county has been named as “Chinese famous tea production base” and “ non-pollution tea production country” by China government. It is named as Cui Lan because it is alike the shape of orchid flower. Tingxi Lanxiang tea is mainly produced in Jing County of China’s Anhui Province. Tea regions have dense forests, climate temperature and humidity, fertile soil, very suitable for tea growing. Ting Xi Lan Xiang belongs to natural, non-polluted green food. Ting Xi Lan Xiang is a kind of tea produced in Jingxi of Jing county of Anhui province. Jing county is an aged tea zone of Anhui province. And in the late of Qing dynasty, the tea of Jing county has been batch exported to southeast Asia. Ting Xi Lan Xiang is produced by the foundation of Jingxi Tikui and use traditional manual craft exquisite and become a series of tea. 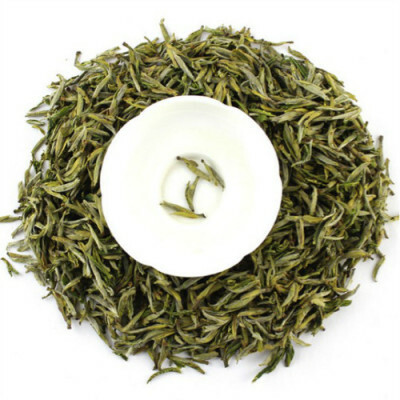 Tun green is green tea, specialty tea of China’s Anhui.Tun green is a famous Chinese roaste green tea, Tun Green Tea, also known as Tunlu tea - and sometimes referred to as Green Gold - belongs to the Top 10 Chinese green tea varieties. The finished product is a tightly rolled tea leaf with a kinked appearance that suggests an eyebrow, which distinctive feature has influenced the names of some of the sub-varieties of Tunlu tea, the main sub-varieties being (in English): Eyebrow, Precious Eyebrow, Tribute, Needle, First Rain, and Green Flake. Lan Xiang is translated as "Orchid Fragrance". a beautiful name it owes to its naturally sweet orchid-like aroma and taste. Tin Xi Lan Xiang is created based on the highest grading standards. 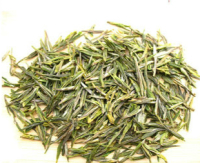 Tun green is a famous Chinese roaste green tea.It has a history of more than 1,200 written years. It has been prized as ‘green gold’ for centuries.